The hubs and I got back to L.A. last week from a very filling Midwestern Christmas, and since then we've been trying some lighter recipes from Eating Well. This is one of my favorite lunches we've had thus far because it's light, it has fresh vegetables aplenty, and it's easy to make. And for those of you who actually have a job (ha), it would be easy to make portions ahead of time to bring to work. Just mix in the dressing when you're ready to eat. Things we did different: We used Thai chili paste instead of hot sauce (since that's what we had). Put a large pot of lightly salted water on to boil. Halve snow peas on the diagonal. Cook the peas in the boiling water until bright green, about 1 minute. Add daikon and immediately remove vegetables with a slotted spoon; refresh in cold water. Blot dry. Return water to a boil and cook noodles until al dente, 3 to 5 minutes. Drain and refresh under cool water. Whisk vinegar, miso mixture, oil, sugar and ginger in a large bowl until blended. Stir in cilantro. Season with salt and hot sauce. 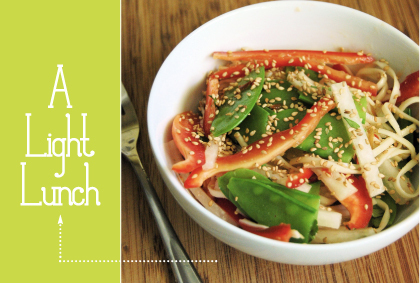 Add bell pepper, snow peas, daikon and noodles and toss to coat. Sprinkle with sesame seeds and serve.